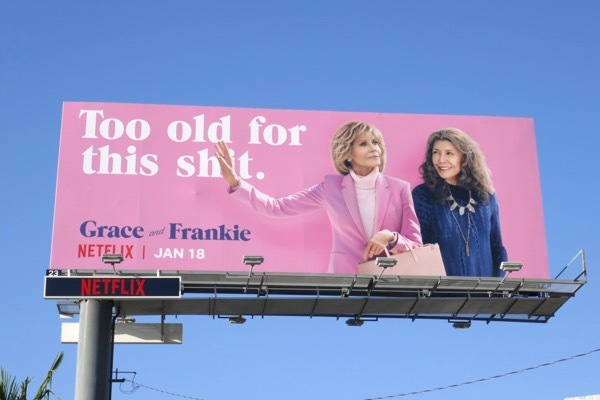 Jane Fonda and Lily Tomlin may be too old for most nonsense, but clearly they're still up for playing Grace and Frankie on the Netflix comedy for a fifth season. This time around the action picks off where it left off as the odd couple cope with finding out their kids have sold their beachside home whilst they were living in a retirement community, their ex-husbands (played by Martin Sheen and Sam Waterson) face more health issues, one of their kids gets married and even RuPaul guest stars. 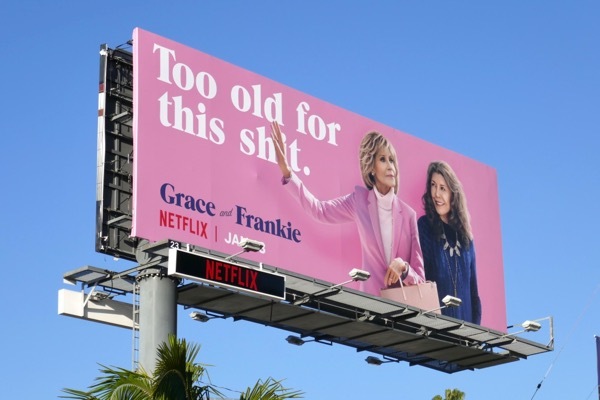 Plus most importantly Grace and Frankie continue to live life to the fullest. 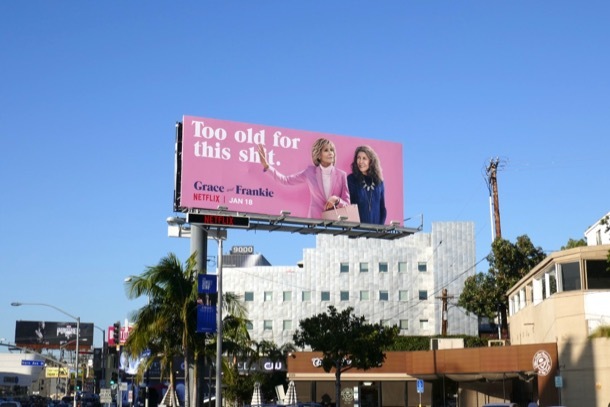 This hilarious billboard was spotted making a spectacle of itself above West Hollywood's Sunset Strip on January 9, 2019. 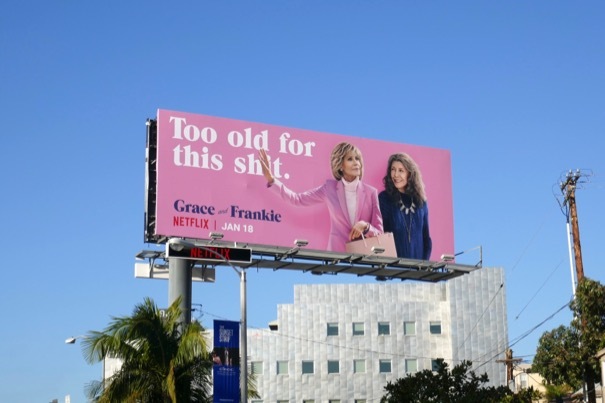 Fans of the show can also check out these previous season promo and awards consideration billboards for Grace and Frankie. Plus Jane Fonda aficionados can also enjoy these Jane Fonda in Five Acts documentary billboards. And for more outdoor ads using coarse language or gestures in a creative way be sure to take a look at this Roast of Rob Lowe billboard, this Backstrom series launch billboard and this Girlfriends' Guide to Divorce billboard. This comedic duo continue to garner industry accolades, so let's hope they continue to be just as funny in these all-new episodes streaming on January 18, 2019. 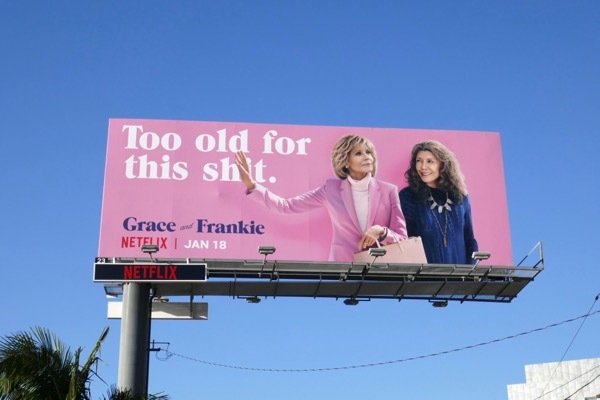 Grace and Frankie may not care what other people think, but audiences certainly seem to enjoy their aging exploits as they've just been renewed for a sixth season. 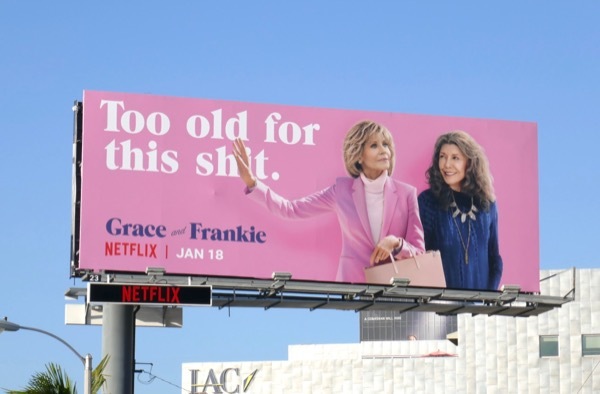 UPDATED: Here's also another example of this ad creative, this time with more of the swear word strategically obscured by Jane Fonda's arm, but you still get the message. 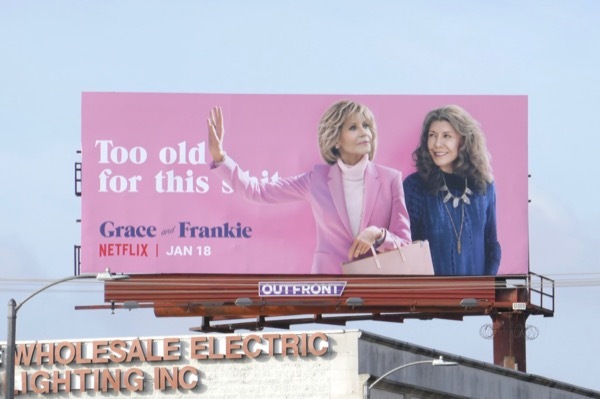 This billboard was snapped high above Beverly Boulevard at La Brea Avenue on January 18, 2019.